This article serves as a guide to create a Bizagi project in an Oracle database. If you use SQL Server, refer to Create a new project. To create a Bizagi project in an Oracle database, you will need to first make sure you have met the requisites for an Oracle database instance in order to work with Bizagi. In this step you need to consider installing Oracle Data Provider for .NET x64 where you have Bizagi Studio installed. This component is required by Bizagi Studio's connectivity with your Oracle database, regardless of the platform you will use for your processes. For doubts on these requisites and Oracle's previous configuration, refer to Oracle database requisites. Once you have your Oracle instance configured to work with Bizagi (having validated requisites, and having created the BizagiAdmon user in your Oracle instance), creating new projects is done as described in the next steps. 1. Use the New project option in Bizagi. Keep in mind that in order to create a project, your account needs to belong to both to the local Bizagi and the Administrators group (where Bizagi Studio is installed). 2. Enter details of your project. Make sure you give your project a name and define its location. 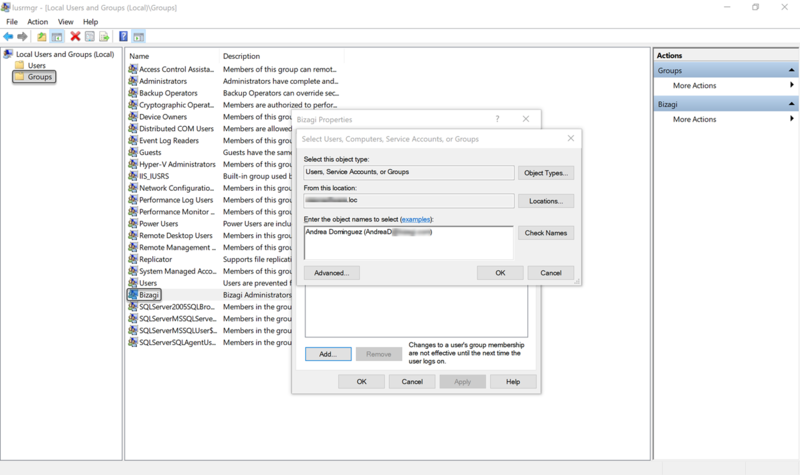 Select Oracle and input both: the instance connection details and the information for this new project. The connection details include the Oracle instance information (Service), and the password for the BizagiAdmon user (as specified in its creation, as prerequisite). Notice that: the service to your Oracle instance is specified as "databaseServer:port/serviceName", and that it is not necessary to mark the Check if BizagiAdmon user is not created checkbox. Click Next to start the project creation. 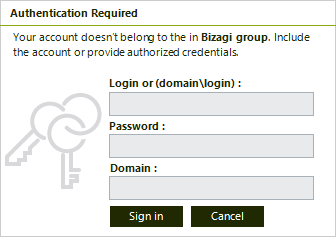 You may use the Check if BizagiAdmon user is not created checkbox to have Bizagi automatically create the BizagiAdmon user for you (if you have not already done when configuring your Oracle instance). If you do, in the next window (Configure Oracle instance), mark the checkbox for Bizagi to create the BizagiAdmon user automatically. Notice that the service to your Oracle instance is specified as "databaseServer:port/serviceName". Click Next, and then Type and confirm the password that will be used for both: the BizagiAdmon user and for the new project you will create. Notice that the paths include: the location where the Tablespace datafile and the Indexes datafile will be created, and the location where the backups will be stored. It is really important that these paths you define have at least 300 MB available for Bizagi to create the datafiles in an initial project. Otherwise, project creation may fail due to out-of-disk errors thrown by Oracle. Click Next to start the instance's configuration, and the project creation.